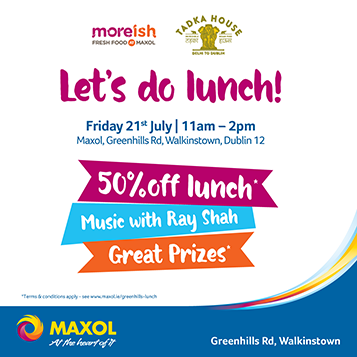 To celebrate the newly refurbished service station and the exciting new food offers available from Moreish Fresh Food at Maxol and authentic Indian dishes from Tadka House we invite you to join us for Lunch, this Friday July 21st from 11am to 2pm At Maxol Greenhills Road, Walkinstown. There will be 50% off lunch menus on the day by Moreish & Tadka House from 11am-2pm and 20% off Tadka House dinner menu all evening! There will also be music with Ray Shah and lots of great prizes to be won. We look forward to seeing you there!